Still 2-years away from completion, the Trump Tower crawls higher into the sky and I counted about 22 floors that now have windows wrapping around them this morning. 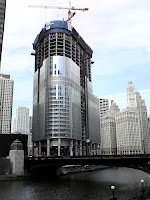 When finished in 2009 the building will have 92 floors and be 1,362 feet tall. Word has it however that the self-titled epicure of real estate is struggling somewhat to offload the 825 units in the tower and 224 condominiums are still for sale. In fact only 8 have been sold since the turn of the year. "People think we're sold out but we're not," Trump said today whilst hosting a news conference downtown with three of his children, Donald Jr, Ivanka and Eric, all of whom Dad has working in the Tower, although doing what is unclear. Such is Trump's self belief that he reckons throwing a sudden news conference in the middle of the street with his kids will make people rush to the sales office and pick up a couple of 600 sq ft studio's for $650,000 each. Er, think again. It isn't that the Chicago housing market is bad, just that there is a lot of choice for someone seeking a new high-rise in the city. During the next 4 years the downtown area will have 16,300 new for-sale residences, in an area with about 90,000 existing dwellings. Next year, a record 5,200 units will be completed and most of these will be in high-rise towers, all complete with skyline views, mod-cons and for a lot less $$'s than the Donald's. The retail areas within the tower are said to be oversubscribed, and I'm sure tourists will flock to buy all kind of crap from stores selling wigs and trinkets. However is living in a Trump Tower worth a premium? After all another 6 are slated to open in the next 3 years. I tell you what would help sales though? How about taking down those "Only a few left" hoardings that go up alongside any new housing construction site?